Ricky Donnell Ross (or ‘Freeway’ Ricky Ross) was an L.A. drug kingpin who was arrested in 1996, and released from federal prison in May 2009. But most people know Rick Ross (sometimes Rick Ro$$) as a rapper from Miami who’s sold millions of records over the past five years or so. Both men have made fortunes, but ‘Freeway’ Ricky’s fortune was short lived – and now he wants it back. 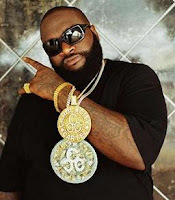 He is suing Rick Ro$$ for trademark infringement in the U.S. District Court, Central District of California (case no. 2:10-cv-04528). Rapper Rick Ro$$’s real name is William Leonard Roberts II. He adopted his stage name after learning about Freeway Ricky’s drug empire in the eighties. According to some reports, Freeway Ricky was making as much as $3 million a day, selling cocaine in L.A. and across the country. He got his nickname after purchasing several properties along the Harbor Freeway. Freeway Ricky was arrested after he was turned in by his cocaine source, Danilo Blandon. Blandon, incidentally, was also the CIA’s contact to the contras in the Iran-Contra scandal. This connection is referenced in several contemporary rap lyrics. Freeway Ricky is going after the whole Def Jam records group, not just William Roberts (Ro$$). The complaint names Sean Carter (Jay-Z) as former president of Def Jam, Maybach Music Group (Ro$$’s label), UMG Recordings, Inc., and Slip-n-Slide Records, among others. Adding to the spectacle, a reality TV production company, Sacred Cow Productions, Inc. (Deadliest Catch, Ice Road Truckers, etc…) announced a new 2010 show “A Year with Freeway Ricky Ross.” The show will chronicle Ricky’s attempts to regain some of his former fortune through legal means. Freeway Ricky doesn’t actually have any registered trademarks on his name, but he claims that William Roberts’ moniker capitalized on his fame, and now he has a hard time distinguishing himself as the “real” Ricky Ross.